For a Washington, DC, wedding photographer, working at a venue like the St. Regis Washington, D.C. is a privilege. From the decor to the staff, that DC hotel is a great place for brides’ and grooms’ marriage celebrations. Any future spouses who book the St. Regis are guaranteed luxury, elegance and excellent customer service. All of which are ingredients for an unforgettable wedding day experience. Washington is filled with great wedding venues like the St. Regis Washington, D.C. It is one reason why DC wedding photographers like us are lucky to be doing our jobs in this city. We get to photograph newlyweds in some of the best locations in the world. The Nation’s Capital offers the opportunity to take pictures in luxury hotels, rustic barns, sunny vineyards and historic museums. That range of different venues gives a breadth and depth to DC wedding photography that is hard to match. And obviously, the diversity of options is great for future brides and grooms! The other great thing about photographing DC-area weddings is the proximity to the most iconic buildings in the world. Marriage celebrations in the Nation’s Capital take place within the shadows of the city’s famous monuments, museums and memorials. 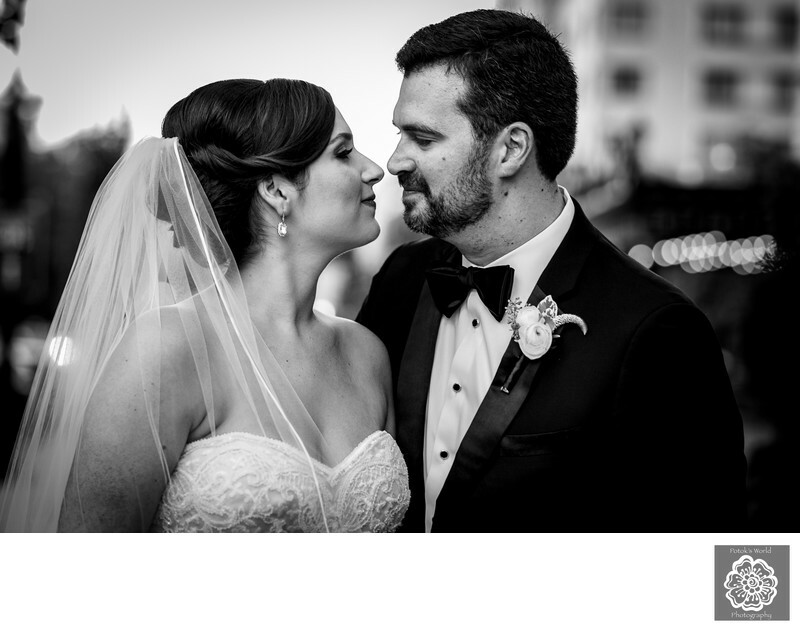 Getting wedding photography that is beautiful and typically “DC” is not hard to do! As great as local venues are for DC wedding photographers, however, photos do not always need stunning settings to be unforgettable. 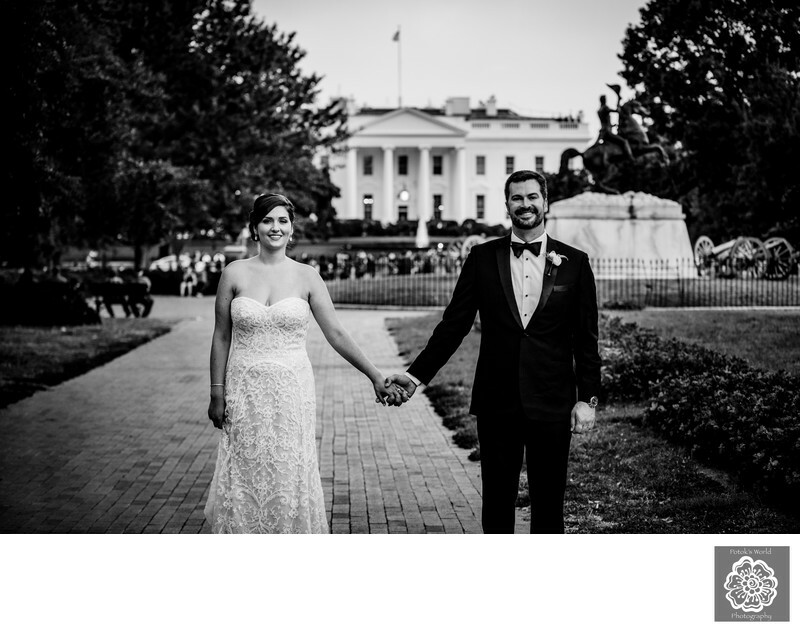 A superlative Washington, DC, wedding photographer can get an award-winning shot anywhere. We have taken pictures of newlyweds against undesirable backdrops many times and still managed to make the couple look fantastic. It just requires a bit of photographic skill. For example, when posing brides and grooms in front of something that does not look great, we can adjust the lighting. If we light the future spouses/newlyweds dramatically, the background normally becomes dark in the resulting images. Not only do our wedding photography clients then get striking portraiture, they also get pictures without an ugly backdrop. A wedding photographer can also make the best of an unfavorable setting is by focusing more tightly on the couple. Using a lens with a long focal length and opening the camera’s aperture highlight the subjects and blur the background. Doing that can be a great way to eliminate a distracting or unflattering background. There are other good reasons for choosing a composition, of course. Sometimes the background of a DC wedding portrait is beautiful, but it makes sense to focus on the couple anyway. On a wedding day in Washington, the two people getting married are always the main story. The setting matters, but in the end, the bride and groom are the most important elements in a photo. So composing an image around just their faces is never a bad idea. Such a portrait looks intimate and private, and highlights the love that connects them. That was the case when we took this portrait of a DC-based bride and her groom. The now-spouses had their marriage celebration at the aforementioned St. Regis Washington, D.C. The cooperative mid-autumn weather made it possible for them to have their ceremony on the Astor Terrace. The latter is a lovely outdoor courtyard adjoining the main hotel building. It is available for wedding ceremonies and receptions, and it also makes a great location for couples portraits. The trees that run around the terrace add lovely bits of nature and greenery to those photos. After the bride and groom in this picture exchanged their vows, we planned to take them to Lafayette Square for their portraits. The latter is the park on the north side of the White House. Before we took them to that iconic part of the Washington landscape, though, we wanted a couple of shots on the terrace. When we posed them there, we were struck by how beautifully they were gazing into each other’s eyes. So even though the background was luscious, we chose to zoom in and just capture their faces. We think the results speak for themselves! Location: The St. Regis Washington, D.C.,923 16th and K Streets, Washington, DC 20006 .